Jack Cornwall Productions is a business founded and run using the latest high-tech sound and recording equipment. By taking advantage of the latest equipment, Cornwall can maximize quality and profits, while decreasing the amount of time spent per project. Cornwall's business plan describes how the business will take advantage of the latest and greatest in technology to grow the business and become a leader, both regionally and nationally. Jack Cornwall has been doing freelance audio production in the Northwest since the mid-1970s, usually while involved with specific broadcast stations. Jack has also had a high interest in consumer and professional electronics since the early '60s. The two areas have interwoven well over the years…and now it's time to take that interaction to a higher level. (cassette and open-reel) to compact disc (CD). Jack Cornwall Productions is an audio production service business, providing audio for radio and television commercials with both industrial and sales narrations, audio and/or video training tapes and telephone holding message services. Jack Cornwall Productions operated as an in-home, part-time venture for just under a year. Beginning with a minimum investment in selected new and used studio equipment (financed through personal credit), the operation recouped start-up costs within 9 months. Since February, 1995, Jack Cornwall Productions has become more formal, with the filing of an Assumed Business Name, acquisition of a Federal Employer Identification Number, a business banking account and Merchant Services Agreement with Bank of America to accept VISA and MasterCard for telephone/mail orders. Jack Cornwall Productions has also been granted a Home Occupation Certificate by the city of Kellogg. The business is operated as a sole proprietorship. A typical Holding Message order will total $65.00 and require about an hour to complete. The Holding Message kit offers the customer a choice of three other voices. Message announcers are paid talent fees as needed. Thousands of people have made family history recordings. In the '50s they were recorded on bulky tube-type open-reel tape recorders. In the '60s, many people switched to the smaller machines with the 3-inch reels. We sent tapes to loved ones in Vietnam, Korea and Europe, and they sent back their living letters. In the 70s and into the '90s, people are still recording their family history on audio cassette. While the cassette player is everywhere, most of those old open reel decks, if they still exist in the back corner of the basement, probably don't work anymore. Market using 800 number advertisements in selected magazines. Charge a per-hour fee plus media costs. Return originals and new discs Mailspeed Next Day Service. 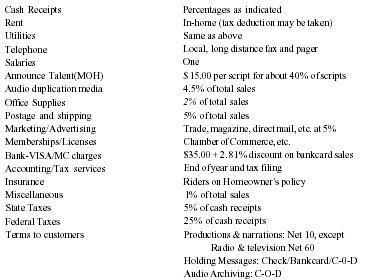 Since this is a new endeavor, there is no definition of a "typical" job, but it is anticipated that an order for 4 hours of audio transfer, plus target media and shipping, should be approximately $ 100.00 and would take about 5 hours. To accomplish these three goals, Jack Cornwall Productions needs $ 15,000.00, which will be used to finance working capital, equipment purchases, and the time and effort to fully market all three areas. Keep up-to-date on advances in audio and video production techniques in order to provide the best service to existing customers. Discover new uses for new and existing technologies. Expand facilities and staff as volume dictates. Update studio tools to streamline production and decrease turnaround. Expand services offered - Real Estate/Travelers' Radio systems, etc. Use CD recorder for telephone Holding Messages to eliminate expensive hardware at end-user location. Actively contact these facilities to determine their audio needs. Produce and ship demo tapes to the decision-makers for presentation to their clients. deliver the finished product (tape) by courier (local, regional or national) the next business day. Potential customer responds to marketing with check or money order for $7.95 and is shipped the Holding Messages kit. Customer information is entered in database for follow-up marketing. Customer sends script and order information. Non-binding estimate is given, based on above criteria. Charges include new media, hourly transfer charge and return shipment. Customer ships source materials (prepaid & insured) via U. S. Postal, Mailspeed, Quick D, etc. Recent issues of Dial It showed only two classified ads for this service, none mentioned price and only one offered a demo tape. Experience in this market. Jack Cornwall has over 20 years of hands-on experience in writing and producing radio and television voiceovers and narrations. Sophistication in distribution. Using today's (and tomorrow's) technologies to receive, produce and deliver finished product is a major advantage. This results in being the quick turnaround supplier in many time sensitive yet somewhat isolated markets. High quality, low price - Jack Cornwall Productions' rates are below others in the market, while the quality and service exceeds expectations.